The Turkey Vulture (Cathartes aura) is probably one of the most misunderstood birds in North America. Some people think they are ugly, but not I (click on photos for full sized images). Their odd looks serve very important purposes. 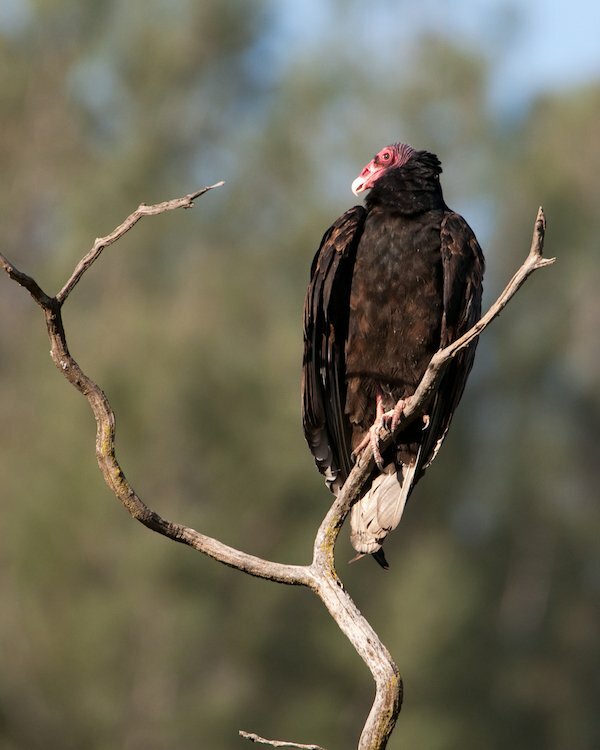 The adult Turkey Vulture’s head and distal neck is reddish bare skin with blackish bristles, which not only helps keep their heads clean when partaking of a carrion meal, they use that featherless head to help regulate body temperature. They can tuck their bare heads into their feather collared necks to help keep warm and when they are heat stressed they will increase blood flow to the head, neck and legs which dissipates heat by evaporative cooling1. usually used to warm up in the morning sun or dry the wings, but sometimes it seems, just for fun. 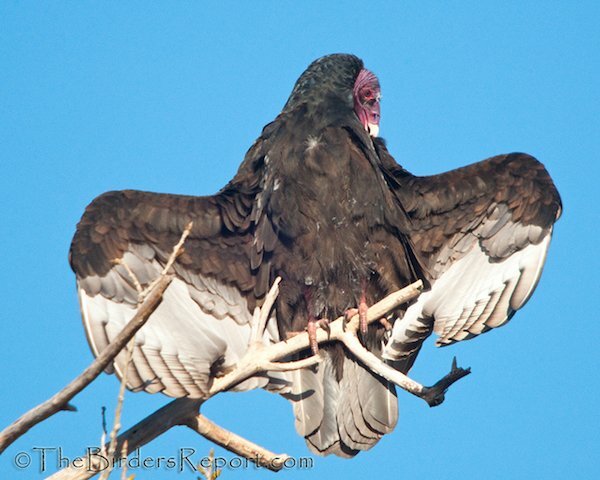 Then there is the “delta wing posture” when Turkey Vultures face the sun and often preen. Turkey Vultures are known for eating carrion but what some people don’t realize is that, unlike most birds, they have an excellent sense of smell. 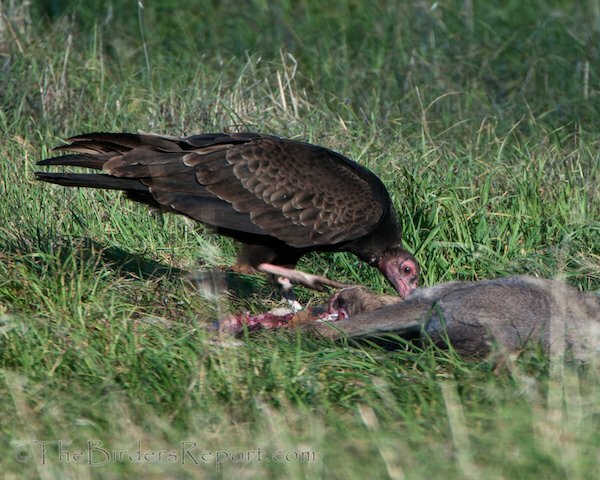 Because of their extra olfactory powers, many other carrion eating birds like hawks eagles and other vultures follow Turkey Vultures to kills. This juvenile bird can be identified by its gray head and black-tipped beak. Here you can see the juvenile and adult on the same perch, the juvie acting submissive. A little bit later the juvenile gets comfortable, probably with a full crop. there were also some Common Ravens having a bit of fun at their expense. Can you imagine how many rotting animals we would have on the roadsides if we didn’t have vultures cleaning them up for us? I think Turkey Vultures deserve a lot more respect from we humans and especially birders. How many times have you been birding when someone thought they spotted a hawk, eagle or other raptor and then acted disappointed when they discovered it was “only a Turkey Vulture.” Come on folks, lets give TVs a fair shake here. They are a very important part of our ecology. Maybe this video of a vortex of vultures I shot during their fall migration will give you a more positive view of these incredible birds. I LOVE vultures! I’m so happy that you highlighted them. Thank you. 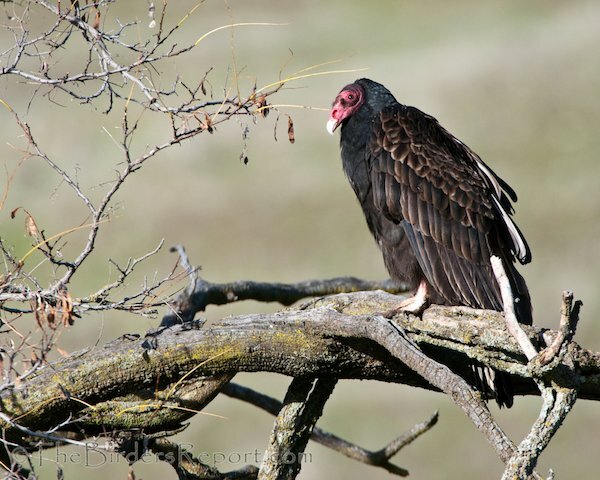 Cool post on the Turkey Vultures, Larry! I think they are great looking birds – not good looking, but great none the less. Like the information on temperature regulation. I assumed the bare head and neck helped with the “gore” factor, but did not know the other stuff. Cheers and thinks for linking to WBW. Happy New Year Larry. I so appreciate this series. Last year I had opportunity to care for an injured Turkey Vulture. It was really something to have one tucked under my arm, no care about it could accidentally hurt me, or that it was not smelling all that grand. It was really a very pleasant bird to work with, that is until it vomited…that is a smell you never desire being around. I really enjoyed these images very much! I think they are kind of cute. I had the opportunity to interact with a very charming and shy education TV who would sidle up to me, then scuttle away until he finally got brave enough to take a dead mouse from my hand. I always enjoy seeing the vultures fly. And I’ve also had the pleasure of observing them at a couple of roosting sites. Thanks for featuring them, and your photos are great! When I lived in California, where they are so common, I took them for granted as the “clean-up crew” in nature. Now I live on the Olympic Peninsula where I rarely see them, and usually only when they migrate through. I wonder who takes their place as scavengers when they aren’t here during the winter months? 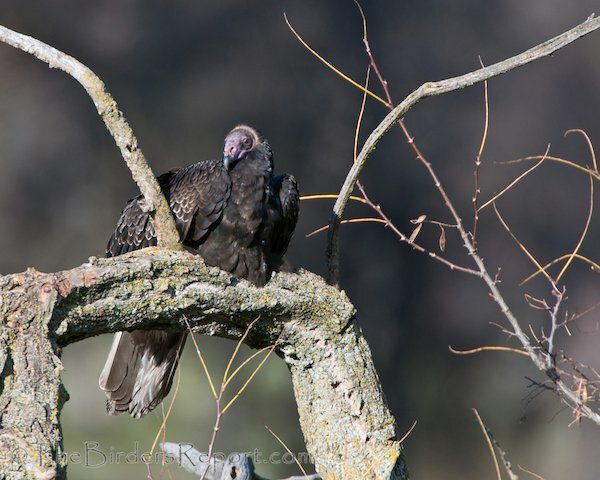 I’m late in making the rounds on this WBW post, however, I wanted to say how much I enjoyed your post about the Turkey Vultures. Wonderful images and video, and good information. We have quite a few TVs here in central Indiana. I love watching them. Your “Migrating TV Vortex” video reminded me of seeing them at Monroe Lake, in Bloomington (Indiana). Turkey Vultures are like pelicans for me. I didn’t grow up around either species so when I moved to Northern California, I never lost my fascination. Now (as Wendy mentioned) living in Washington, I catch only fleeting glimpses of them which make me long for home. To stand below a crew of 10 or 20 vultures circling on thermals is pure magic. And I agree with you Larry … they are stunning, particularly from a photographic perspective, where you notice the nuances of their form. I have to say … my favorite part here is the vulture’s pirouette on the post. Lovely and humorous at the same time.